When it comes to garden furniture, white has always been a popular colour. Even on dreary days, white garden furniture brightens up the garden and makes it more appealing. For this reason we have made sure that we have a wide range of outdoor furniture in this colour. Whether you are looking for a side table or a 12 seater garden table set, we have a variety of patio furniture models in different sizes and shapes. This is also the right range if you're looking for individual tables instead of full table and chair sets. All of the tables in this range are made from cast aluminium. We are specialists in cast aluminium garden furniture, and we choose to focus on this material for good reason. Anyone who's owned teak, cast iron or wrought iron garden tables will have experienced what we have. Wooden furniture is prone to rotting or splitting, and is generally easily damaged by moisture. Preventing this costs effort and money in coating the furniture in weatherproof paint. Iron furniture is prone to rust, and is very heavy. Weather resistant metal paints exist, and furniture covers are an option, but these are an extra cost and hassle. 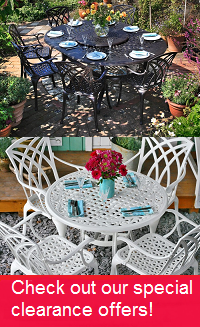 Your new white, cast aluminium garden furniture from this range won't rust or rot. Cast aluminium is superbly weather resistant. You won't need to do anything to it to make it weatherproof either. Just leave it outside all year long, it will handle whatever mother nature throws at it. Choose aluminium patio furniture and spend less time on maintenance, and more enjoying your garden. The Frances table is a circular, white 6 seater garden table set with a very ornate table top. It can fit a parasol through the hole in its centre, and is 150cm in diameter. The table set comes with a Lazy Susan turntable. These are a fabulous addition to al fresco meals with family or friends, enabling you to pass around condiments and appetisers easily. Reaching over each other to get seasonings etc. is an awkward part of any lunch or dinner. That's why we've included a Lazy Susan with most of our larger round tables. You may need twice as many places as the Frances table has. We have options for those in need of larger tables too. The Isabelle table and Deborah table are both a 12 seater garden table and chairs. The Isabelle features a classic lattice design on its table top, and the Deborah table has a sleek, slatted design. Both are extension tables, too. To provide a little extra space in the garden, you can retract the table when you don't need the extra places. For even larger gatherings, we have the Sophia table, a 14 seater garden furniture set. For drinks and lunches in smaller gardens or patios, try the Ivy bistro set. This lightweight table measures 63cm in diameter and comes with two gorgeous, matching bistro chairs. The Claire table is a garden coffee table. It's provides a handy surface for drinks, phones and magazines when placed in front of a patio sofa or one of our lovely garden benches. If you're purchasing a garden furniture set, you will have a number of chairs available to pair with your garden table. Look underneath the product photo gallery and you'll find these options. A default chair is available at no extra cost, but there are other styles too. If you like the look of the Emma, Maria or Jane chair then pair it with your table for between £5 and £20 per chair. Your white aluminium garden furniture will be more enjoyable with a few accessories such as cushions and a parasol. Under the section where you select your chairs, you’ll find offers for these accessories in various colours. Combining them with your garden furniture set allows you to save up to 70% on them, compared to buying them separately, so don’t miss out! Those aren’t the only available offers. Get between 20% and 80% off various aluminium outdoor furniture items, like garden bistro sets, sun loungers or benches. But these offers will be unique to this page, so combine them with your main order to take advantage. We have some outstanding deals on our clearance page, too. These standalone deals apply to everything, from benches to table and chairs sets. They change all the time, so check back regularly and if you see a bargain on something you like, grab it while there's time! Our friendly customer services team is available to take your calls and answer your emails from 08:00 to 18:00. They can provide more information about our aluminium garden furniture and respond to any other questions you have. They can also send you fabric and metal samples. These give you an idea of our materials and help you select the colour which best suits your garden. Call us on 01243 717197 or email us at [email protected]. We try to answer emails within 2 hours during office hours. Please take a few pictures of your new garden furniture to help us raise money for our Do Some Good charity campaign. Just share them on Facebook or Instagram with the tag @LazySusanFurniture or email them to us. We then donate £10 for any set of photos of Lazy Susan furniture in your garden. We’ll donate £20 for photos including friends and family during a family lunch or BBQ. Your help goes a long way.